Following a word prompt. Because right now, that’s how I roll. We embarked on a 40 day Daniel fast last week. We fasted this time last year too. Read about it here. The Nativity Fast happens this time of year, otherwise known as St. Philip’s fast, so we join others in our pursuit of less of me. On the Daniel Fast we eat anything that grows from the ground and drink only water. Phil and I enjoyed lunch, a bowl of spinach, nuts and fruit. 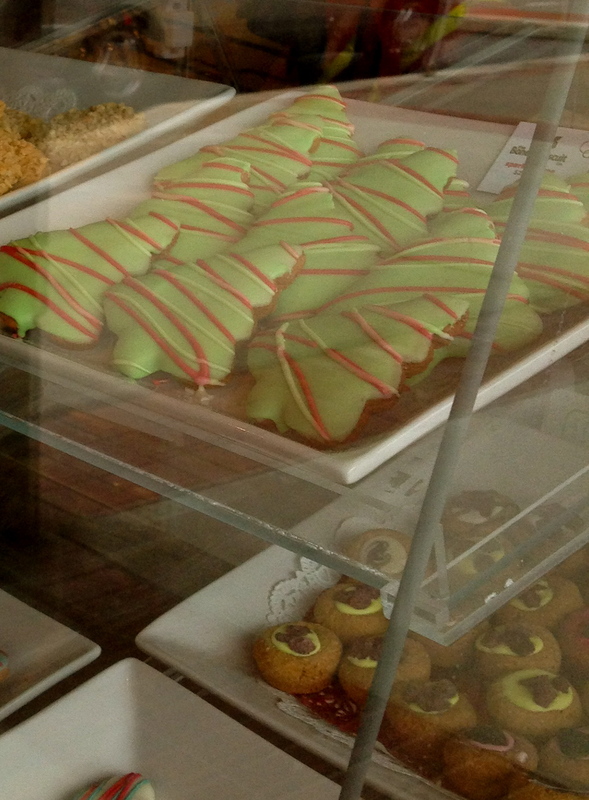 We left the Chopped Leaf feeling all healthy and vegetarian and walked along the path, Phil stopped and began to salivate, his carb and sugar starved body drawn to brightly colored bakes. ‘Mmmmm. Christmas cookies.’ he said. I encourage Phil to be strong and step away from the window, offering him more raisins. And laugh and then laugh some more. As we realise we are looking in through the pet food store window. And while this Friday word prompt is over ‘Thanksgiving week’. It could be any Friday, whatever the colour. Or even better – everyday. Thank you. It’s an everyday word. Life is dark, an occasional spark. Shout thanks. Heart is dull, words null. Mouth thanks. Commotion crashes, peace merely flashes. Cry thanks. In this and every other place, this sacred space. Live thanks. It is not what we say about our blessings, but how we use them. Living thankfully, showing, not telling, is a true measure of our thanksgiving. Drop by next week, I’m going to share stories from the Hope Centre. One of my fave places on.the.planet. Seriously. As ever thankful for you, your love, and your stories. I have never heard of this fast, but what a lovely idea for the season. I’m visiting from 5 minute Friday. Thanks for visiting Anna. It certainly creates a different focus in the crazy Christmas prep. I’m so intrigued by this sacrifice. To know that you are doing the fast of your own choosing and not as a organized or designated observance for your church or congregation. Very inspiring. Thanks for your comments Phyllis. Look forward to reading your posts.